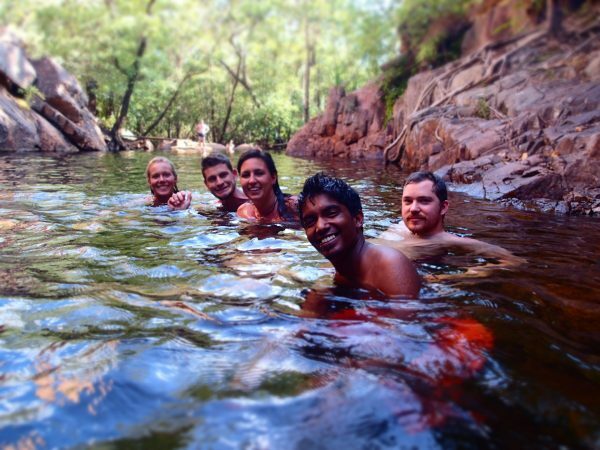 Explore the top end of Australia on this 2 day adventure into Kakadu. 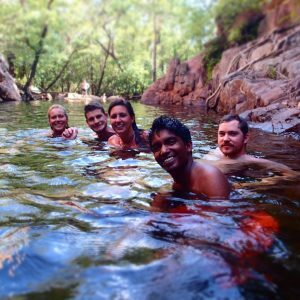 This small group tour is a great introduction into the Indigenous culture and natural environment that Kakadu is world famous for. Get away from the crowds and take in the vibrant colours of the wet season. Vehicle – You will be travelling in a vehicle specifically designed and built for Australian outback conditions. All our vehicles are 4WD, air conditioned for your comfort, have Ipod connections and large panoramic windows for uninterrupted sightseeing. Pick up at 7am from your nominated accommodation. We start our Kakadu tour by heading towards Kakadu to join a crocodile jumping cruise. This is a great opportunity to get fantastic photo of the local wildlife. After the cruise, we commence our drive toward Kakadu National Park. Stop & enjoy a picnic lunch on the East Alligator River bank with the opportunity to spot some crocs and flying foxes! Welcome to Kakadu National Park! Arrive at Nourlangie Rock, an ancient Aboriginal occupational and art site. Explore the sites before walking up to Gunwhardewharde lookout for an exceptional view over the escarpment, including Nawurlandja. After a visit to the Warradjan Cultural Centre, we make our way to Mardugal Safari camp nestled in the heart of Kakadu. Dinner tonight is an Aussie BBQ with a taste plate of croc, buffalo and kangaroo. Early to rise for a big day and some great walks! Pack up camp and head to either Gunlom Falls (when accessible) or Yurmikmik. These walks will get your heart rate up, however you will be rewarded with a refreshing swim. Next is a visit Bowali visitor centre before departing Kakadu National Park and heading back to Darwin.